Galaxy S8+: Is the Samsung Galaxy S8+ (SM-G955W) dust and water resistant (IP68 rating)? With Samsung's most resilient mobile device yet, you can run in the rain, play in the mud, spill on it, splash it, dunk it, then wipe it off and keep going. 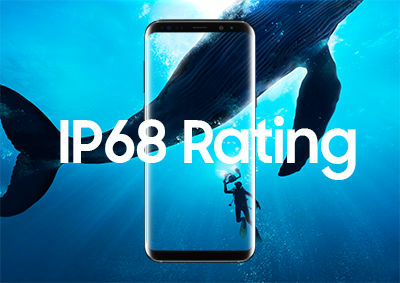 The IP68 dust and water resistance ingress Protection rating means your device is completely protected against dust, and it is water-resistant in up to 5 feet of water for up to 30 minutes. Your device has also passed military specification (MIL-STD-810G) testing against a subset of 20 specific enviromental conditions, including temperature, dust and sand, shock and vibration, low pressure, and high altitude. Warning: Device may not perform in all extreme conditions. The touchscreen may not be active in water. • Whenever your devices gets wet, dry it thoroughly with a clean, soft cloth. • Do not expose the device to salt water or ionized water. If your device is exposed to salt water, wash the device with fresh water, and then dry thoroughly with a clean, soft cloth. Otherwise, when it dries, salt may accumulate and block the primary microphone, earpiece, and external speaker. • When drying off your device, be sure to pat the earpiece (top front of the device), primary microphone (bottom of device), external speaker (back of device), and the power/accessory (USB) interface connector with a clean, soft cloth to remove as much water as possible. • When making a call immediately after your device is wet, the microphone may have water in it, which may lower the volume that the other person will hear. After drying off the device, allow the device to air-dry before making a call. • Physical damage to your device such as chips and cracks can significantly reduce its ability to resist dust and water.